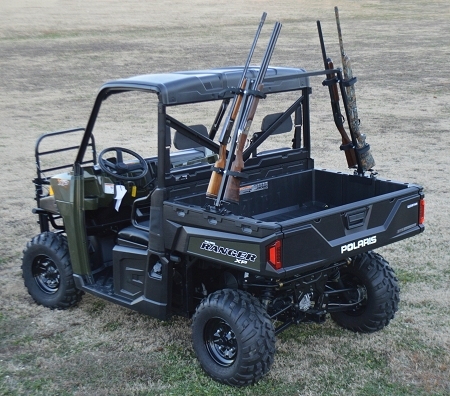 Great Day’s QD804SC UTV Gun Rack is designed to fit all popular utility vehicles that include cargo beds. It attaches securely to the sides of the cargo bed with use of lag screws or bolts positioning gun holders for two firearms on each side. The gun holders are strategically placed at an upward angle to prevent the firearms from being pointed at participants or bystanders. The QD804SC is framed in heavy-duty aircraft aluminum and includes cushioned gun clips that can be set at different heights and are moldable to conform to size of the firearms. The Sporting Clays Gun Rack weighs only 8 lbs and ships by UPS.